Arriving home after a week away, rather skidding to a quick stop with tons of laundry. I found myself rushing to get the house in order and pull together a quick appetizer for a friends 50th cocktail party. Lucky for me we have a fabulous fish market just around the corner. I was thinking something with shrimp but just as I arrived at the market a new batch of cooked lobster was placed into the display case. Lucky me! I love lobster, who doesn’t? It screams special occasion. And this was. After a quick stop at the grocery for some celery, mango (no mango try papaya), red onion, cilantro and jalapeno. I ran home and mixed up the fixins with some mayo with hot sauce, easy huh? 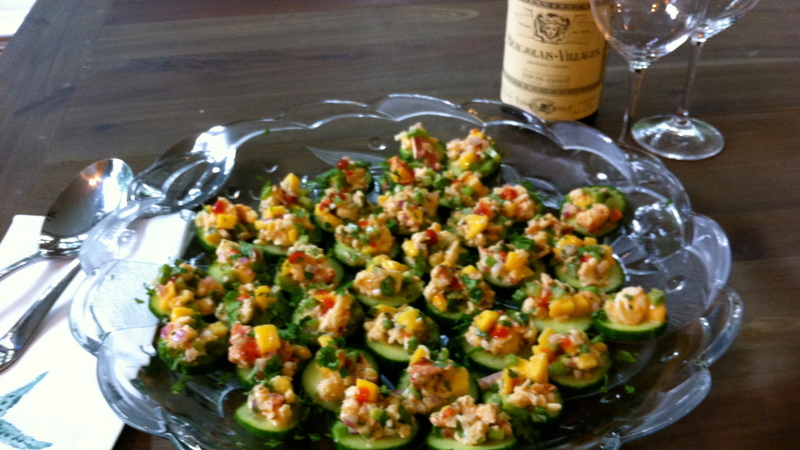 You can serve this on top of cucumber slices, as I did, or piled in a center bowl surrounded with crackers. Or spooned onto a bowl of lettuce for a easy salad at home. Start adding your cooked lobster to a large bowl (click here for cooking instructions). 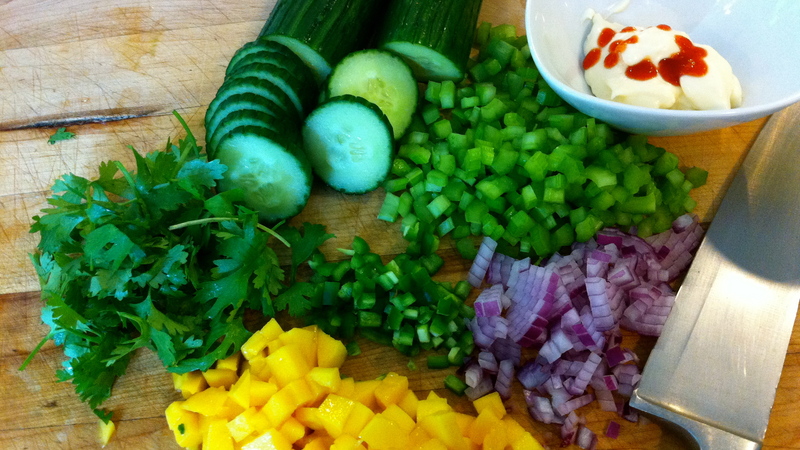 Add celery, chopped nice and small, same with the red onion, jalapeno, then mango mix it up. Combine the mayo and hot sauce, I used Sriracha (think I am addicted!) and squeeze of lime. Add to lobster mixture. Sprinkle in cilantro and mix. Spoon onto cucumber slices or endive leaves. Add a few drops of Siracha on top and a sprinkle of cilantro. 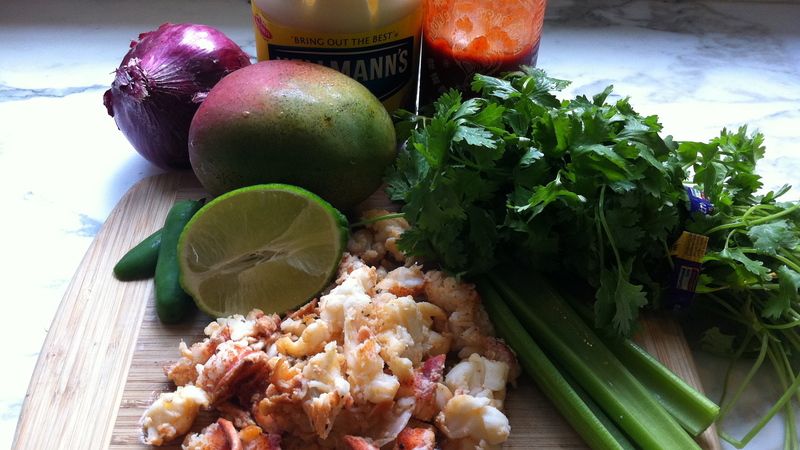 In large bowl add lobster, celery, red onion, mango. Mix mayonaise with hot sauce and lime juice. Add to lobster mixture. Spoon onto cucumber slices, sprinkle a bit more cilantro over top. Hi there, Thanks for your post, it was really informative. I’ll be looking forward to coming again…. Hello, I really like this article, pretty good reading. I’ll be looking forward for your next post…. Hey there, I really like this article, pretty good reading. I’ll be looking forward for your next post…. Hello, I really appreciate your post, pretty good reading. I’ll be looking forward for your next post…. Hi there, I really like this article, pretty good reading. I’ll be looking forward for next article of yours….